Home » Why Start Exercising, Now, Over the Holidays? Why Start Exercising, Now, Over the Holidays? If we want our habits to stick, we need to start really, really small. It is hard for us humans to make a major behavior change (like swapping that holiday cocktail for a jog). Here’s the thing: It’s much better to succeed at something rather unambitious (and then build on that success) than to fail at a more impressive goal. Almost all of us can pull off a brilliant couple of days, or even weeks, of ambitious exercise. But unless we have a really big catalyst for our change, like a very scary health diagnosis or other crisis-level event that provides us with immutable (and long-term) motivation, we’ll usually crash and burn soon after takeoff. We’ll have a couple of good weeks, but then we’ll have a bad day and skip our planned exercise. The next day we’ll decide that the whole routine is too hard and we’ll skip it again, resolving to make revisions tomorrow. The day after that we’ll hardly think of it at all. We’ll be back at square one. The alternative to being super-ambitious when we create new habits is to build slowly. And because most of us have very little free time over the holidays, we feel better about doing something small — we can more easily see that something is better than nothing. So we are more willing to be shockingly unambitious in our exercise goals than we are are willing to be come January. And that is the very thing that will help us succeed! You, too, can do something ridiculously unambitious like this, and when you do, you’ll be carving a neural pathway in your brain that will eventually become an unshakable habit. Join the Discussion: What’s stopping you from starting a new exercise routine? Will you make time this holiday season? Share your thoughts below. Do you need support starting (or sticking to) an exercise habit? If so, you aren’t alone, and I really hope you’ll consider joining me in my brand new online class designed to get you into an exercise habit for the rest of your life. Here’s what’s best about it: It’s SUPER FUN, and you can do it even if you don’t have enough time to go to the gym. My new Establish an Exercise Habit Mini-Course is only $4.99 through Monday, November 29 at midnight (use the coupon code CCBlackFriday). 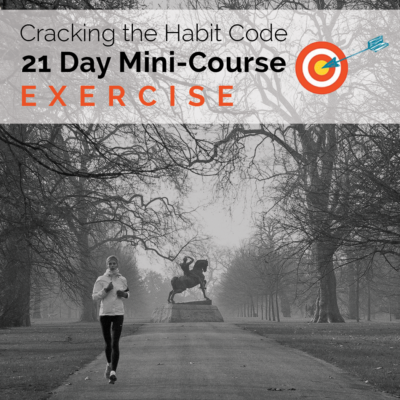 Over the course of 21 days, it’ll deliver all the science you need to establish and keep an exercise habit. The mini-course includes access to a private Facebook Group for moral support and online coaching from me, Dr. Christine Carter. Learn more or enroll now here.